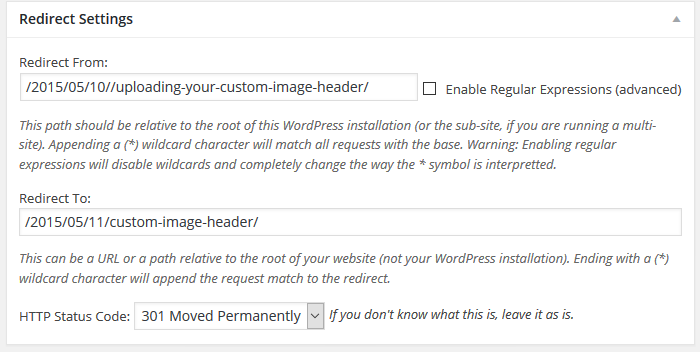 The Safe Redirect Manager Plugin allows you to redirect your site, pages or posts to new URL’s. 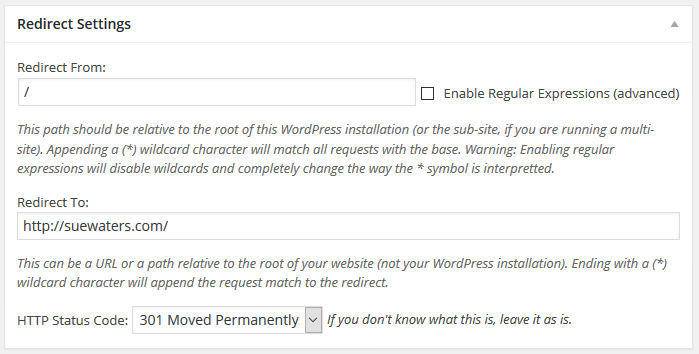 Once you’ve activated the Safe Redirect Manager Plugin in Plugins > All, you’ll see a new Safe Redirect Manager menu item added to Tools > Safe Redirect Manager. Safe Redirect Manager Plugin is a CampusPress only plugin. To redirect to a new site URL the original site must be set to “Allow search engines” or “Discourage search engines” in Settings > Reading otherwise the redirection won’t work for logged out visitors to your site. 1. 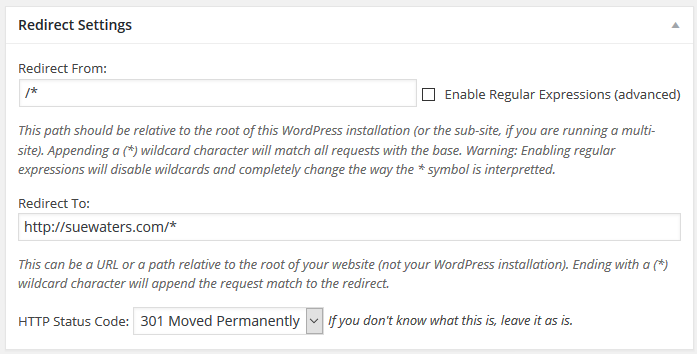 Go to Tools > Safe Redirect Manager inside the dashboard of the original site. 3. Add your Redirect From, your Redirect To and select your HTTP Status code. The Redirect From is written as / and the Redirect To as the URL visitors will be redirected to. The status code would be set to 301 Moved permanently. 6. Add your Redirect From, your Redirect To and select your HTTP Status code as shown in the example below to redirect from post or page URLs to the new site URL. 8. Check your redirection is working by visiting the original URL as a logged out user. It should redirect immediately to the new URL. 5. Check your redirection is working by visiting the original URL as a logged out user. It should redirect immediately to the new URL. 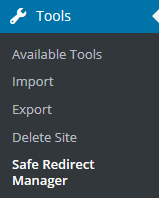 All redirects are listed in Tools > Safe Redirect Manager. Edit – Opens the redirect rule in full edit mode where you can edit any field. Quick Edit – drops down a quick edit box where you can check the status of the redirect rule. Trash – removes the redirect rule and sends it to your trash folder where it is automatically deleted after 30 days. View – launches the redirect rule so you can see how it works.